WILMINGTON — The Washington Blue Lion cross country teams competed in the Finish Timing Invitational at Wilmington College Saturday, Aug. 26. Washington’s Maddy Garrison placed fourth out of 267 runners with a time of 20:09.1. Jenna Burns of New Richmond won in a time of 18:18.7. The Lady Lions were 12th out of 16 teams in the high school event with 316 placement points. Cloe Copas was 53rd as a team member (86th overall) in 24:06.1. Alexa Harris was 81st as a team member (169th overall) in 26:44.5. Haley Copas was 82nd as a team member (172nd overall) in a time of 26:46.9. Abby Tackage was 96th as a team member (230th overall) in 29:25.7. Jordan Kearns was 100th as a team member (251st overall) in 31:53.9. Camryn Waldrop was 102nd as a team member (257th overall) in 33:36.7. The Washington Blue Lion boys high school team placed 19th out of 25 schools. Kameron Morris was the top finisher for Washington, 64th as a team member (79th out of 471 runners) in a time of 18:07.7. Ben Burkett of Centerville won the race in 16:00.1. Brandon Underwood was 114th as a team member (218th overall) in 20:05.2. Chris Conger placed 118th as a team member and 224th overall in 20:11.0. Connor Lane was 123rd as a team member and 235th overall in 20:23.6. Will Baughn was 127th as a team member and 248th overall in 20:33.3; Grant Patterson placed 132nd as a team member and 269th overall in 21:01.6 and Kalub Wilkerson was 146th as a team member and 318th overall in 21:45.4. Nicholas Geiler was 329th in 22:01.9; Cody Riley was 341st in 22:19.3; Christian Grove was 437th in 25:54.5; R.G. Crabtree placed 438th in 25:55.0; Gabe Pickerill was 462nd in 29:59.3; Jordan Rohrer was 463rd in 30:17.2 and Keiya Satoh was 468th in 31:31.0. In the middle school girls race, Washington’s Kaelin Pfeiffer was 16th in 13:52.2. Chloe Lovett was 30th in 14:28.4; Kayli Merritt was 63rd in 15:36.8; Mia Moats was 115th in 17:06.6. Washington did not have enough runners to post a team score. Karrer Middle School won the girls meet with 51 placement points. Ashlyn Vanlandingham of Conner (Ky.) won in a time of 12:48.1. There were 224 runners in the middle school girls race. In the middle school boys race, Washington was 11th out of 14 teams. Jacob Moore was the top placer for Washington, finishing 19th out of 261 runners in 12:30.2. Karson Runk was 50th as a team member (77th overall) in 13:48.1; Ian Roush was 56th as a team member (94th overall) in 14:05.6; Justin Grove was 71st as a team member (128th overall) in 14:42.9; Ryan Elrich was 75th as a team member (158th overall) in 15:14.8; Jack Mead was 84th as a team member (210th overall) in 16:36.7; Luke Rader was 90th as a team member and 248th overall in 19:14.4; Kylan Lawell was 252nd in 19:43.4 and Brenton Dawes was 261st in 22:00.3. Centerville won the middle school boys meet with 29 placement points. Unioto was sixth with 190 placement points. Hillsboro was 13th with 354 points. Washington’s next cross country event is Saturday at the Circleville Kiwanis Invitational. Centerville, 1st, 60; Anderson, 2nd, 75; Miamisburg, 3rd, 92; Lakota West, 4th, 143; West Clermont, 5th, 184; New Richmond, 6th, 187; Chaminade-Julienne, 7th, 213; Clinton-Massie, 8th, 233; Sardina Eastern, 9th, 238; Felicity-Franklin, 10th, 301; Wilmington, 11th, 309; Washington, 12th, 316; Conner (Ky.), 13th, 328; Miami East, 14th, 354; Hillsboro, 15th, 359; Dayton Christian, 16th, 409. Centerville, 1st, 48; Elder, 2nd, 76; Lancaster, 3rd, 89; Unioto, 4th, 95; Miamisburg, 5th, 142; Lakota West, 6th, 182; Anderson, 7th, 190; Oak Hills, 8th, 219; Conner (Ky.), 9th, 249; Sardinia Eastern, 10th, 343; Wilmington, 11th, 353; Miami East, 12th, 407; New Richmond, 13th, 420; Chaminade-Julienne, 14th, 447; Blanchester, 15th, 460; Hillsboro, 16th, 505; Northeastern, 17th, 541; West Clermont, 18th, 543; Washington, 19th, 546; Felicity-Franklin, 20th, 585; Clinton-Massie, 21st, 599; McClain, 22nd, 638; West Union, 23rd, 640; East Clinton, 24th, 705; Dayton Christian, 25th, 706. Washington senior Maddy Garrison, above, left, competing in the Finish Timing Invitational at Wilmington College Saturday, Aug. 26, 2017. Garrison placed fourth out of a field of 267 runners. Washington freshman Cloe Copas running in the Finish Timing Invitational at Wilmington College Saturday, Aug. 26, 2017. Senior Alexa Harris of Washington runs between two competitors at the Finish Timing Invitational at Wilmington College Saturday, Aug. 26, 2017. Middle school runner Chloe Lovett competes in the Finish Timing Invitational at Wilmington College Saturday, Aug. 26, 2017. 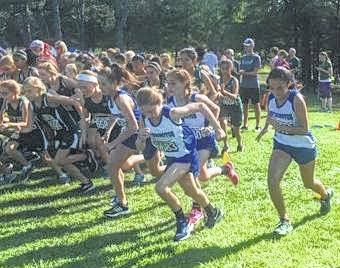 Washington Middle School girls at the start of the Finish Timing Invitational Saturday, Aug. 26, 2017 at Wilmington College. 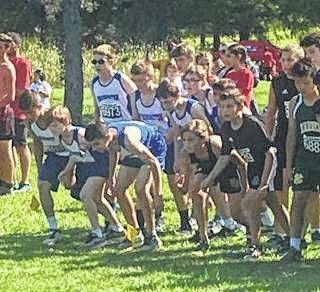 Washington Middle School boys at the start of the Finish Timing Invitational Saturday, Aug. 26, 2017 at Wilmington College.